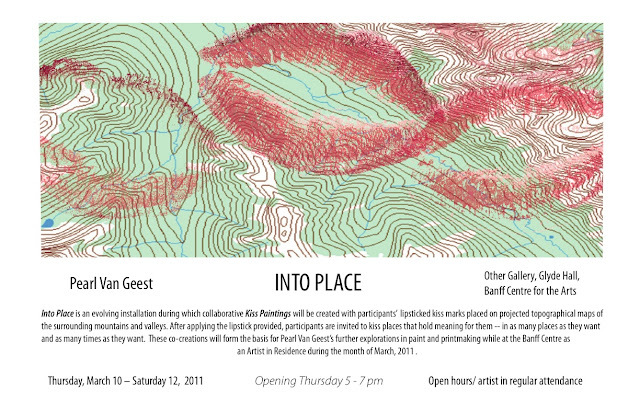 "I will be setting up two collaborative Kiss Paintings, one here at the Banff Centre as indicated by the invitation above and one this weekend in Golden BC. For both I will project a topographical map of the surrounding landscape and people are invited to put on lipstick and kiss the places that hold meaning for them. The paintings will be 6' x 9'. I will then make photo emulsion silkscreens from photographs of the kiss marks and use these to make a further series of paintings based the places identified and from sketches and photographs done while visiting the places that are accessible. In addition - for the installation in Other Gallery here at the Centre I will be adding a large scale grid of "pronto plates" (they act like a litho stone) on which I will have digitally printed the topographical map. When the kiss marks are added I will print these plates much a like litho so for these the contour lines, the tones of the landscape features and the lip marks will all be in tones of black and grey so that the lip marks will be another shape integral to the map. My project draws upon and extends my ongoing exploration of our connection to and perception of the natural world and the environment, our place in it and our desire to be part of it. The work draws upon the theory of biophilia, the idea that humans have an innate love of nature, as proposed by Edward O. Wilson. Other ideas are alluded to: for example, in Erick Fromm’s allegorical explanation of the exile from the Garden of Eden story he proposes that humans became aware of themselves as being separate from nature while still being part of it and that this existential dichotomy can be solved by the human powers of love and reason. In Brothers Karamazov by Dostoevsky, the mystic Father Zossima, says that we should "“Kiss the earth and love it with an unceasing, consuming love.”"
Kiss marks are used for their mutable symbolic significance and also for their remarkable morphological similarity to other natural forms -- suggesting by implication, an essential corporality and an evolutionary connection with the natural world. Conceptual/process painting and performance art is combined with the language of abstraction, pop art and landscape painting." Before leaving for Banff, Van Geest began working on a new series of paintings: they are very different from the "kiss" painting, but it is evident that she continues to explore themes of biophilia, exile and connection, and our place in the natural world. We'll post images of her new work in the near future. See work from Van Geest's recent exhibition at KWT here.